We offer a wide range of Oil Seals in various sizes. 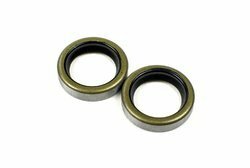 These Oil Seals are primarily used to protect the end used parts from any type of leakages. These seals are fabricated from quality material that is got from the reliable vendors of the industries. Moreover, our Oil Seals are highly efficient in providing an excellent seal to the oil tanks or other parts in automobiles. We offer a wide variety of Fabricated Rubber Oil Seals, which are fabricated in accordance with the international norms of quality. Manufactured using high quality materials, these rubber oil seals provide smooth functioning to the engines. Moreover, our oil seals are used for preventing any kinds of fuel leakages of the engines and therefore, widely used in various automobiles. Looking for Oil Seals ?